The 28 year old Hungarian goalkeeper, Adam Bogdan, made his debut for Wigan Athletic at Macclesfield last week, saving a penalty within minutes of coming on to the field. The 6 ft 5 in tall keeper has been signed on a season-long loan deal from Liverpool. Bogdan was born in Budapest and started his career in his home city for Vasas, one of the country’s foremost clubs. However, it was during a loan period at Vesces, a lower division club from the suburbs that he was spotted by a Bolton scout. He was to sign for Wanderers as a 20 year old in August 2007. Bogdan went on to spend 8 years at Bolton, making 120 appearances. He was to establish himself as a top class goalkeeper. In July 2015 Bogdan joined Liverpool on the termination of his contract with Bolton. However, his start at Anfield was less than auspicious. On his Premier League debut for Liverpool in December 2015 he dropped a corner after three minutes, leading to a goal for the opposition, the Reds going on to lose 3-0 to Watford. Then in early January he conceded a goal direct from a corner in an FA Cup tie at Exeter. He had to wait until the final game of the season to reappear in the first team. More than any other position, goalkeepers tend to be remembered for their mistakes. All keepers make them, but Bogdan made them at Liverpool at inopportune moments. However, the big Hungarian has proved himself to be a top class keeper and he could make an outstanding contribution to Wigan Athletic’s return to the Championship. He has 20 caps for Hungary and would surely have had more if it had not been for his lack of game time at Liverpool. In order to learn more about Bogdan’s time at Bolton we reached out to Chris Mann of the Burnden Aces fan site http://www.burndenaces.co.uk (Twitter @BurndenAces ). Chris has provided us with some excellent fan views in the past and this one is a good read too. 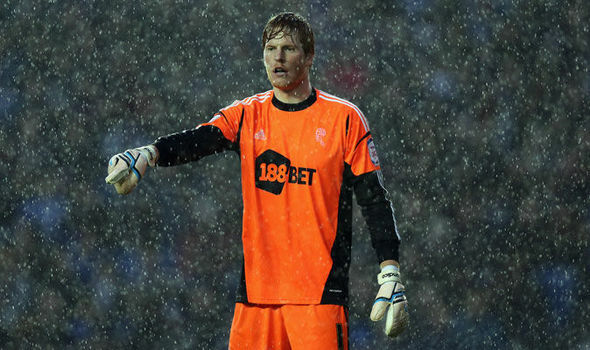 Wigan Athletic completed the season-long loan signing of Adam Bogdan this week. The move may be a little underwhelming, but could serve as the catalyst he needs to get his career back on track. After eight years with Bolton, Bogdan departed at the end of his contract last summer and made the mistake of signing for Liverpool. Some may question how you could turn down such a move, but he was always going to be second choice at Anfield. Ultimately, a couple of costly mistakes in rare appearances saw him slip down the pecking order. It wasn’t just his club career that suffered. Bogdan should have been taking goal for Hungary at this summer’s European Championships, but a lack of game time over the last 12 months saw him left out of the squad entirely. At the end of his career, he may look back and wonder whether his brief time at Liverpool was worth it. Bogdan moved to Bolton in August 2007, as a fresh-faced 20-year-old. Initially signed to link up with the reserves, Bogdan was way behind Jussi Jaaskelainen, Ali Al Habsi and Ian Walker, but had all the raw ingredients to be a success. Years of cup appearances and the occasional league outing followed, before Bogdan got his big chance at the start of 2012 – in a relegation campaign that saw him go on to be voted Player of the Year at the Reebok Stadium. Bogdan established himself between the sticks on our return to the Championship, eventually going on to make a total of 120 appearances, having seemingly shaken off the indecisiveness and lack of self-belief that had threatened to halt his progress. He remained prone to the occasional error, but was largely consistent and an excellent shot-stopper. An outstanding individual display in an FA Cup tie at Liverpool put watching eyes on him and it wasn’t long until he was on the move to Merseyside. 12 months on, Bogdan has a point to prove. Gone are ambitions of European football, replaced with cold midweek trips to Burton Albion and Barnsley. But if he gets his head in the right place and, crucially, manages to avoid injury, Wigan have signed a goalkeeper that, without any disrespect, should be turning out at bigger and better places on a weekly basis. This should prove to be a very smart deal for Latics. ← Has Caldwell got it right in the pre-season?